Soon after my sister and I walked into this bakery in Pune, when the three of us were visiting her and my brother-in-law, I noticed the lovely Parsi lady, probably in her late sixties or early seventies with a beautiful scarf tied round her head. I immediately knew that we were in for good quality baked goods since Parsi and Irani bakeries in Mumbai and to a certain extent Pune are well known for the baked delicacies they offer. In fact, the old Iranian bakeries lend a lot of old world charm to Mumbai. And when I asked for eggless goodies, we were directed to these beautiful to look at, heavenly to smell, cardamom scented cookies which literally melted in my mouth. I could really taste the butter and I simply can’t resist cardamom in cookies and biscuits. We picked up these, some biscotti and bread and we were well set for the journey back to Mumbai, the next morning. When I returned home and kept munching on these cookies, I simply couldn’t resist replicating it in my kitchen and kept wondering how to start! 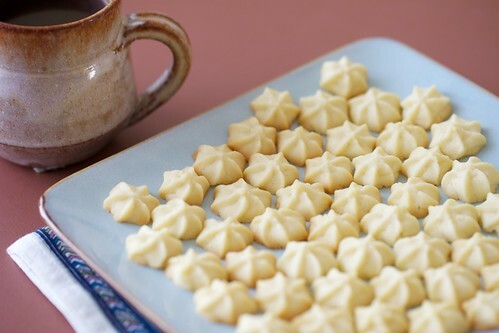 Then my mind raced back to my old recipe files, where there was a treasure, a recipe called vanilla cookies which said to pipe the cookie batter into tiny 1/2” rosettes. The ones I was eating were piped into 2” rosettes. And then, an excited me went about baking them. I decided to skip the cardamom and put in vanilla as I was making them for Hari’s friend Leela’s 2nd year birthday. But these taste so good with cardamom too. I give equal points to both, so you decide what you want to choose. Also, this is one of those recipes which is traditionally eggless and I didn’t have to make any changes for egg replacements, only changes to the recipe in my files, handed by an acquaintance, to suit my requirements. Maybe they are called melting moments because they literally melt in the mouth. I like to pipe them with my 1/2" star nozzle which results into tiny bite sized cookies. 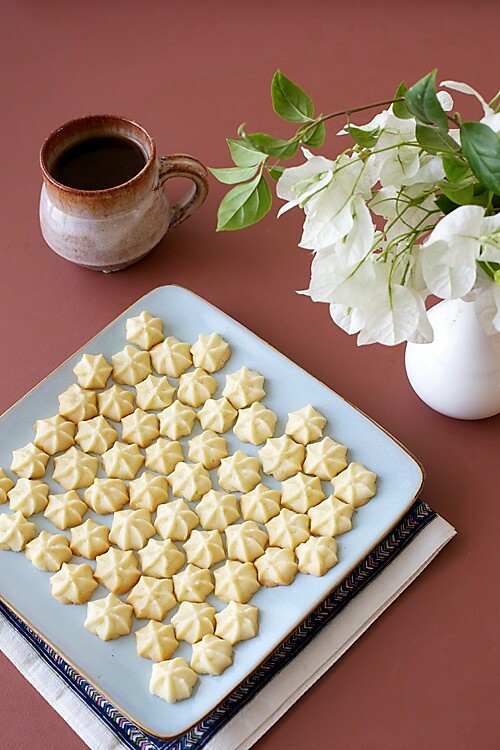 These look so pretty when piped into rosettes with a small, medium or large star nozzle, but if you don’t have the star nozzle, you could just use your hands to make these into tiny or medium sized round cookies and they look just as gorgeous! 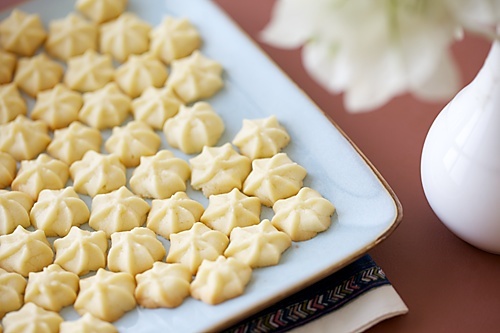 Watch and learn how to make these cookies! You could use the vanilla or 1/2 tsp cardamom powder. You can also dust these cookies with icing or confectioner's sugar. Put in the flour mixture and vanilla extract and mix until smooth and there are no lumps. Add a little milk only id the dough is stiff. Pre heat the oven to 180 degrees centigrade/ 350F/Gas mark 4. 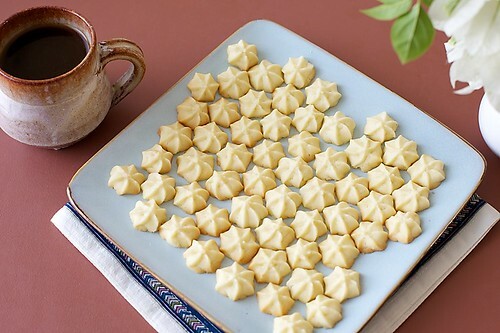 Put the entire mixture into a piping bag fitted with a star nozzle and pipe into stars (rosettes) on a lightly greased baking tin or a tin lined with baking parchment. Alternatively make small balls, flatten lightly with your palms and bake. The baking time depends on the size of the cookies. It could be 8 to 10 minutes for small cookies and 10 to 12 minutes for larger cookies. Make sure you keep a close watch on your oven ad take the cookies off after you see them turning golden brown at the edges. 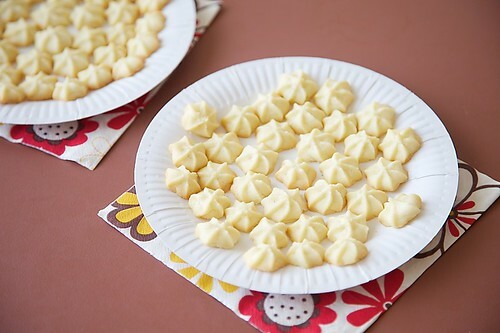 Oh..I am in love with these tiny rosettes!So simple and easy to bake..lovely, Anu. Would love to try with cardamom flavors. Beautiful and cute rosettes. I love easy cookies recipes and this one sounds perfect.Would be making these soon with cardamom. Oh I could have them all..looks so cute–lucky birthday girl!! The pictures are awesome! So nicely done! I love your treasure trove of eggless recipes. These cookies look fabulous and love your pics. How wonderful with a cup of tea. Great recipe find. Is there anyway at all to make these less fattening…? like halving the butter maybe…? Very nice as always…not sure but I think you mean corn starch here? The white color one and tasteless am i correct? Corn flour is the yellow one and has heavy taste of corn? Harshita: Unfortunately, like M.F.K Fischer said, the best things in life are either too fattening or too expensive..lol! The cookies would be too dry and not melt in your mouth if you halve the butter. It's okay for occasional indulgence…so go ahead and enjoy! Swarna Mani: What you want here is what is called Cornstarch in the US and Cornflour in the rest of the world (UK, Australia, India, etc). You don't have to use cornmeal or polenta here. Good luck with your baking! First time here (just fell in love with the recipes from your blog in Divya's post) and you definitely have an amazing space. These melting moments truly look very beautiful and inviting. I tried these and everybody loved these (Mine were not so pretty:) as I just made thumb print ones). Do you have some suggestion for making savory cookies such as with ajwain or cumin? Also, my cookies melt in oven. How do you retain shape? Tejas: Will try and post savoury cookie recipe. Hope you will be patient. If you have measured accurately and you bake at the right temperature, these most definitely wont melt. Either the temp is too high in your oven or you have used too much butter. First time here and loving it!!! I don't eat eggs and ur site is like a treasure discovered for me 🙂 Bookmarked your Mango cheesecake recipe. Gng to make it soon. Also I welcome you to my site. Please do visit whenever u find time. wonderful blog! I jst tried these small wonders..,they were the best cookies i ahve ever baked! thanks a ton for also giving ingredients in grams,rather than just cups,as it is confusing whether it's an indian cup or the US..
urmila: I'm so happy that these were the best cookies you made. Thank you for the feedback. I use a standard cup, 1 cup=250 ml as given in the measurements & conversions section. Can I just add chocolate chips to the batter to make choc chip cookies? NSJ: I doubt if chocolate chips would work here. If you do try, let me know how you like it. I made this cookies today n it turned out awesomeeeeeeee.. Stil gettin compliment from my family. Dedicating al of those to you dear. Was little skeptical so halved d ingredients u gave. N instead of corn flour i added custard powder.. Next time wil try it wit wheat flour too..
Looks very delicious. I shall try for sure. Shraddha: Great! Thanks for reporting your success! Thanks for the recipe.. looks gr8… tried baking tastes gr8 but dosent look as good as yours.. I tried them twice… exact measurements and right temprature but mine melted.. can you suggest what should I do. Also please can you tell me how long before should I pre heat the oven so that it is not too hot..
Yamini: Is your oven behaving well otherwise? The cookie dough should not be very soft and loose for it to hold shape.Preheating for 5 minutes should be fine. Longer is not exactly good for these cookies. Anushruti….u r like my new found best friend!! the picture of these cookies had me making a bee-line for the kitchen.i must confess that i did tweek the recipe a bit. added dried cinnamon cranberries,almonds & white chocolate chunks.it made ur otherwise PERFECT recipe even better!! Pria: I'm sure the cookies would have tasted great with all your wonderful addition! Thank you for reporting your success! Rashmi: I just made a batch of this recipe and it gave me exact results! Looks like you have not measured the flour correctly! Please use a metric weighing scale and bake to get good results! Hi, I was tempted by the pictures and i tried using the exact measurement, but mine melted. The taste was good, but was shapeless. I tried decreasing the temperature but still the same output. Any tips please. Raechel: Sorry to know that your cookies melted. This recipe works fine for me and many others too who have reported their success here and elsewhere so I'm a bit baffled when you say that your melted. Can you give me a few more details? Did you measure your ingredients in cups or metric? Did you bake in the centre of your oven? Give me more details and maybe we can figure out what went wrong. Hello! Thank you for sharing this wonderful recipe. The first time I tried these I used the cup measures and the cookies melted into a flat, think disc almost like a wafer. Nonetheless the taste was superb!! They did indeed melt in my mouth. The second time I weighed the ingredients and they turned out perfect! Just wondering if the original recipe is in cups or metric weight? Noodlehead: What measure is your cup? I use the 250 ml cup and when I need to make these cookies in a hurry, I always measure in a cup. You need to pack the flour into the cup though. If measured correctly, both cup and metric should work. I'm happy that you got it right the second time and even happier that I could be of help to you this diwali. Happy diwali! Hi Anu..another wonderful and tasty recipe. I tried making these biscuits. My vanilla batch melted but they tasted so delicious! I added more flour and corn flour to my second cardamom batch. I was just guessing at this point, trying to dry up the mixture. I roughly added 2 more tbsp of flour and 1 heaped tsp of corn flour and voila! They are baking and intact..I can't wait to get this batch out of the oven for a taste 😛 Now I have an eggless recipe for christmas biscuits..can't wait! Thanks!!! sassubai: I have made this many times with the same measurement of ingredients. Did you measure in metric or in cups? If you have measured in metric you will not go wrong here. These cookies look divine. Could we use regular powdered sugar or only icing sugar? DC: You can, but icing sugar will give this the required lightness since it has cornflour or cornstarch. I tried this out and it came out great. Thanks for posting. i was a little confused on the butter requirement. Since the flour was 3/4 cup – u had mentioned 100 gm. and the butter was 1/2 cup – u had mentioned the same 100 gm. just the confusion in the cup measurement and the actual weight. i went with the 1/2 cup butter anyways. cathy: There is nothing to be confused. I use a 250 ml measuring cup. 100 gm butter is equal to 1/2 cup (125 ml). 1 cup (250 ml) four is equal to 140 gm and 3/4 cup is 100 gm. I made these cookies and they were perfect. An apt gift for my friend…he wiped them in minutes. I wanted to post this recipe on a blog im starting and wanted it to be the first post. Let me know if its fine if i mention Divine Taste as its recipe source. Thanks for your lovely recipes! Richa: Nice to know that your friend enjoyed these cookies. Ofcourse you could go ahead and post the recipe with the credits. Hiii, i made these cookies, but i hve baking prb with these, i baked it fr more than 20 mins but bottom is nt baked, i had set at both side temperature at 160 degre, even preheated my oven. Hey! I just stumbled upon your website a couple days back while looking for some new recipes to try. Honestly the recipes you've put up here under Egless Baking are absolutely fabulous! I baked these Melting Moments yesterday and they turned out quite well! Melt in your mouth! But i do have one question: Could i use Castor sugar instead of icing sugar and also everybody in my famiy thought the cookies were amazing but could use a little more sugar and in that case how much could i safely add w/o making it too sweet? Akshaya: Glad you liked these cookies. It is better to use icing sugar to get that lightness in the cookies. You can however replace it with castor sugar. These cookies are not meant to be overtly sweet, but since this is so subjective you can use 100 gm sugar to get to a sweet level that is not over sweet. Good luck with this and let me know how it went! should v use cooking butter or amul butter? rakhee: You can use any butter. We are an NGO working for all round rural development, through a network of goshalas and want to set up bakeries in each goshala to provide training to the villagers, women in particular, in different skills. Bakery, we believe, is one activity that can be undertaken in all the villages, since most of the ingredients are available there and the same can help value addition of these goods. We were attracted by your emphasis on SATTVIK food, which must be maintained at all costs in a goshala. Would you be interested in helping us in some way or the other? I just tried the cookies. I underbaked them a little bit (maybe because mine were somewhat bigger), but they are still very good. I made a few changes because I didn't have everything on hand – I used almond meal instead of corn flour and substituted cinnamon and ginger (1tsp each) for the cardamom. I used the vanilla anyway. I'm very happy with the results but next time I'll increase the baking time with at least 3 minutes. I have another suggestion for those of you whose cookies melt too much – are you using vanilla extract instead of cardamom? It might be just a teaspoon, but its liquid vs powder, so it might be a reason.. I made these cookies yesterday. I followed exact cup measurements and exact oven temperature (my oven works well). They turned out very tasty, crispy and melt-in the mouth types, but they came out like Nilgiri drops that we get in Bangalore 🙂 I was not dissappointed at all, but would love to have them retain their shapes the next time I do. Can you suggest something, like adding a little bit more flour or something like that? Thank you. Ashwini: I think you should skip the milk and add only if you feel the dough is stiff since different brands of flour have different liquid absorption capacities. Will update the recipe. Hi Anu! Just chanced upon your site while looking for an eggless cheesecake recipe and needless to say, I've been hooked from that very second.. I made these yesterday.. My nozzle wasnt very large so I had to pipe them into small roses.. They turned out lovely even though they flattened just a tad.. I wanted to check on the consistency of the dough – should it be like a thick paste or more like a dry crumbly short bready kinda dough.. I first got the short bread kinda dough but then wondered how it would pipe, so added a teaspoon of milk.. the first batch turned out awesome but while waiting for it to bake I noticed the remaining dough turned quite dry so again added another teaspoon of milk to it.. Should I avoid doing that the next time I make this? (And there definitely will be a next time).. Also I noticed that the first batch kinda became a little soggy within 15 minutes of them cooling on the rack.. Do you think its the current weather in Mumbai or do these tend to become soft very soon?? Vidya: Glad you enjoyed the cookies. Appreciate your feedback! Veera: The consistency of the dough should be soft but not loose. There is no need to add extra milk. If stored in an air tight container these should not become soggy or soft. Mine stay crunchy for weeks. Hi anushruti.. Tried this recipe.. It was quite easy to make.. But I had to bake it at 160 c, middle rack. Also they went soft after few hours, even after keeping it in an air tight container. Also… Any cookie that I bake never comes out good.. Even if I follow the recipe to the T. Cakes, pies, cupcakes… Everything I bake is always good.. But cookies… I am at the verge of giving up on them. Any idea what might be going wrong? Hi Anushruti, I've made these cookies twice and they turned out great. I'd like to try them with lemon flavoring, using lemon juice and zest instead of vanilla – I just hope it doesn't ruin the consistency. Christine: Using lemon juice would ruin the consistency since its acidic in nature. Use lemon oil or zest instead. Hi! I made those gorgeous cookies on Monday night and now my husband ask for them every day! Thanks for share! Carolina: Nice to know that! Its a great feeling for a baker when seconds or more are asked. Hi, just baked a batch of cookies, followed the recipe but left out the milk as it said optional. I could not pipe rosettes . The cookies spread out a lot but held their shape. Taste is very good a little too sweet for me, will reduce the sugar next time. If I want to pipe the cookies do I have to add milk? Shruthi: You may add milk only if you find that your dough is very stiff. Hey there! This post could not be writgen any better! He always kepot talking about this. I will forward this post to him. 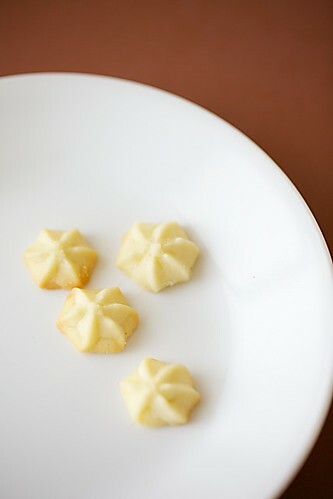 hieee…i am a new baker…i am very keen to try these cookies.can u please tell me which butter you use for these cookies? ..normal salted amul one or unsalted one? Krushi: I use normal salted butter. I’ve made these cookies twice and they turned out great. I’d like to try them with lemon flavoring, using lemon juice and zest instead of vanilla – I just hope it doesn’t ruin the consistency. cookies- lemon juice will affect the consistency of the cookies. Try using lemon/lime extract and zest for the falvour. Seemap: Sure, will keep this in mind. I adapted your recipe to make coffee flavoured chocolate cookies. They were great! Thanks! Would love for you to visit my blog! Ranjana- Great to know that. Will definitely visit. Hi Anushruti, Thank you for the recipe, I think of dipping the one half in melted chocolate – nice to share the baking with the girl friends! Elize- Hello! Dipping the cookies in melted chocolate sounds very exciting! Can I use homemade white butter to make cookies. what changes I should make? Poonam- Great to know that! Poonam- No changes, you will have a heavier texture. Hi, just happened to c this post n also all the comments related to it. I just feel tht chilling the dough will prevent it from spreading. Please correct me if I m wrong. Sneha- Chilling the dough might help if the temperature is very hot. I dont do it though. If you measure the ingredients correctly, there should be no problem. I've tried many shortbread eggless recipes but cornflour & icing sugar were the secret to success!. I am so happy that I got the same taste as the Pune/ Mumbai Irani/Parsi bakeries. This one's going to be a keeper. I piped flowers & added a choco chip in the middle – they are so pretty n tasty. Thanks a ton for the recipe! I live in East Africa, Tanzania and always miss the biscuits/cookies available in India. I tried this recipe and the biscuits turned out Divine. I used my hand to roll the balls and then my son flattened them slightly with fork to make a criss cross design. Thanks a lot for the amazing receipe. Chandni- A big hello to you! How nice to hear that. Thanks for writing to me! Hi, thanks for the recipe! I tried it and it tastes really good! The only problem was that the little rosettes that I made did not hold shape while baking. I used 20g extra sugar to make it a bit more sweet. Could this be the reason? Thanks. Nidhi- It can't be because of extra sugar. Your dough was loose. Skip/reduce the milk next time and add only little if required. Rithika- My pleasure. Thanks for the feedback. Happy to hear this. Hi i made these biscuits and they came out really nice but after the second day it left a bitter aftertaste. How can this be prevented for the future? Shanon- Use fresh butter or salted butter. hi anushruti !! made these melting moments few minutes back and the results were good 🙂 they were perfectly baked but the only problem was that the base of the cookies were not completely flat instead slightly porous like bread.may i know the reason ? would be helpful . Fathima- You can use margarine, but I love the flavour of butter here. Hi,pn what mode should I bake them? Both rods on or just the lower one? I tried making these biscuits and they tasted so delicious! Now I have an eggless recipe for biscuits..forever with me Thanks!!! Will definitely try soon Dear. Sujata- great to hear this! cookie press the same which is been used for this recipe by you. So request you to provide the details of the press. sujata- I'm sorry but I cannot provide you the details of the cookie press as I got them from different countries and I don't know where they are available here. But if you look in amazon you will find a plenty of similar options. 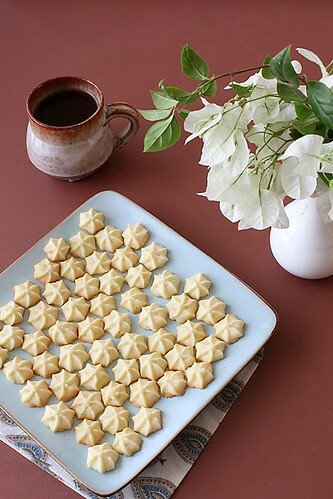 I tried making these lovely biscuits a while ago and they came out pretty and delicious! 🙂 i didn't even use a cookie press because i didn't have one. I just used my piping tip and bag for this one and the cookies still look great. 🙂 thank you so much for the recipe! Shanen: Thanks for the feedback. Hi. Can we add cocoa powder in these same cookies to make chocolate cookie? I've made these cookies before and they are amazing. Just wanted to know how long do they stay fresh. And if anyone has tried coloring them. They stay fresh for 6 to 8 weeks if kept in any airtight container. Yes you can Rithika. Replace 30 gm flour with cocoa powder or a little more if you want a more pronounced chocolate flavour.